Looking Our Best’s (LOB) is in a nostalgic daydream. She is lounging on a distant summer lawn, wearing a big hat, sipping a Tom Collins. Through the mist, a green light beckons. She is borne back ceaselessly into the past. Okay, you smart bookish types. You have recognised shameless paraphrasing here, courtesy of F Scott Fitzgerald’s classic 1925 novel, The Great Gatsby. But with the latest movie version about to open the Cannes Film Festival, you’d need to have been mouldering lifeless at the bottom of a swimming pool to miss the fashion references just about everywhere. LOB fondly remembers the 1974 film version. 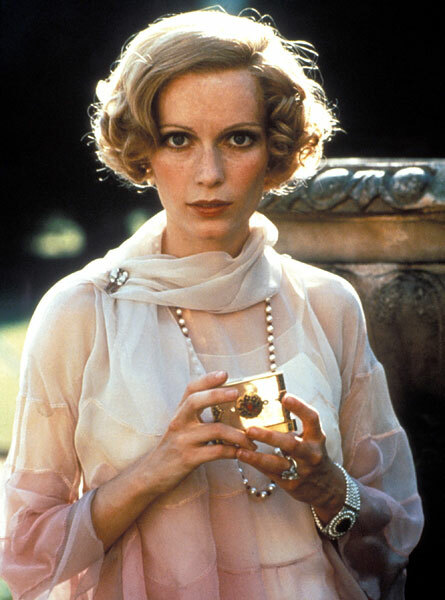 It featured a dreamy Robert Redford as Jay Gatsby, and an ethereal Mia Farrow as the focus of his hopeless love, Daisy Buchanan. Costumes for that film were courtesy of Ralph Lauren; this time around costume designer Catherine Martin (wife of director Baz Luhrmann) has hired Miuccia Prada to create Daisy’s (Carey Mulligan) shimmering flapper girl look. In both screen versions, the clothes reflect the desire among the wealthy, Bright Young Things of Long Island during the early1920s to mix their Ivy League classics with the fashions then arriving from Europe. But for us bright older thingies inspired by a Jazz Age style revival, what happens if you're no longer in your 20s, but in your Roaring 50s instead? Will you look tragic second time round wearing a chiffon dropped-waist tea dress with demure little strappy shoes? But we don't have to stick to an elder-Daisy look; us grown-up woman might look classier by channelling the man himself in his striped blazers, cricket flannels, cashmere sweaters and co-respondent shoes. (Debenhams sale, €44) plus a straw fedora ( Penneys, €5). But if LOB were a money-no-object Long Island aristo, she would be chauffeured around in a vintage Rolls, wearing this striped cotton blazer and wide-legged white trousers by Ralph Lauren (below left). has an ageless elegance and would be perfect for afternoon tea on the lawn with a passing hedge-fund manager/bootlegger. Fresh white separates, as opposed to a white dress, may be the more age-appropriate option. The mannish look of these vintage-style, pleated-waist trousers is complimented by fine-cotton lawn, sleeveless embroidered top, (below left) both from Malene Birgir. The same designer creates a similar nautical style with these red wide legged trousers, ivory linen pullover and large crochet hat (right). 653 page hits last month for the blog (and the stats are not tracking my own hits to the page!) Great news..... 4,865 page hits in total for blog overall. Way-hay! Thanks C - I love this whole Gatsby theme, but as I say in the post, feel I can't get away with it at this age!